Bushman Equipment, Inc. recently shipped a mechanical upender (tipper) rated for 100 tons (200,000 lb). The loading and unloading platforms are 168” x 132”. The drive motor is 25 HP and is controlled by an AC flux vector variable frequency drive. The upender will be pit-mounted so that the platforms are flush with the finished floor. The upender cradle rails rest on four (4) two-wheeled bogies for load equalization. 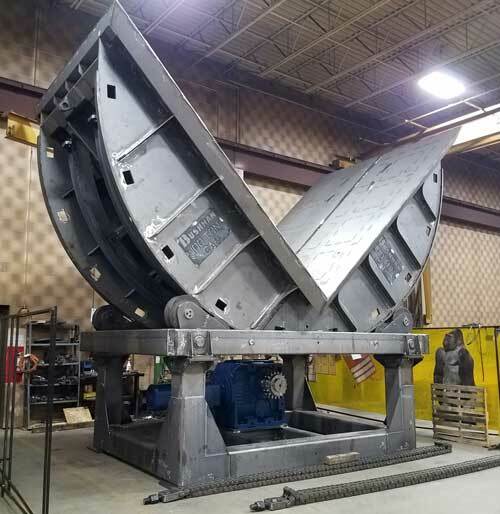 Bushman mechanical and hydraulic upenders are engineered-to-order in capacities through 200 tons. They can include many optional features that provide operational safety and efficiency for your business.